Finally a sign of life! But am I too late? I need to get a closer view of it. It's really fascinating to think of any living being on that harsh god forsaken environment. I assume it must be terribly warm out there, although it is wonderful to see how animals have evolved and fitted exactly the right way they have to. Lovely picture, Anjana. Looking forward for more interesting pictures from you. it is definitely alive!interesting photos.congrats for taking the time to explore. hey,forgot to add,joe is me,monsoon dreams. 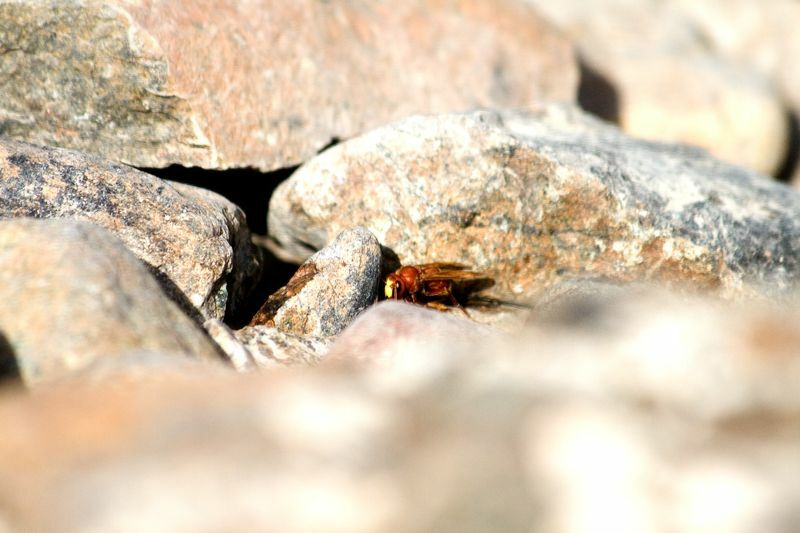 A type of desert Vespid (wasp)? It does look like it's alive cause of the bright skin tones, but then again.. can't be 100% positive considering the drastic desert climates. We were there for 3-4 hrs and that was also between 7-11am. Even at that time the heat was unbearable. So just imagine? It is really amazing to see how they survive in a place like that. Thanks buddy and I hope you will enjoy the rest of the series. Yep it’s a wasp. Let’s see; if I can get close enough maybe we can get clear the doubts ha? So it was a wasp! =D Thought desert critters look much different from ones over here.